In December 2016, AFM-EPF beneficiaries received a letter from AFM-EPF trustees, warning us to seek a new retirement plan beyond our promised pension benefits. Trustees suggested we arrange for "… a comprehensive retirement strategy that includes a personal savings component to supplement the AFM-EPF pension." Simply put, our pension benefits could be cut so drastically that we would not be able to rely on them for our retirement. without any sort of warning or preparation? Milliman, Inc. is our fund's actuarial firm. They determine if and when the AFM-EPF moves into critical and declining status, a term that would make our fund eligible for application of the Multiemployer Pension Reform Act (MPRA). Our pension benefits could be drastically slashed through MPRA, but this would happen only if Milliman projects that our plan will become insolvent in the future. What if their projection is wrong? Actuaries repeatedly state that projections over long timelines are necessarily inaccurate. Industry-wide standards (Horizon Actuarial Services) maintain that the reasonable range of investment assumptions is 6% - 9% over the next 20 years, which is a very wide margin. In the case of our Plan, it could mean the difference between a scenario where benefits are cut and where benefits are preserved. Musicians for Pension Security (MPS) believes that an independent opinion by a reputable, industry-accredited actuarial firm with experience in handling multiple employer pensions is needed. This firm will scrutinize all of Milliman's assumptions and question how conservative or aggressive these assumptions are. An independent actuarial opinion can decrease the possibility of cuts to our pension based on what could be an inaccurate and faulty actuarial projection. MPS formally requested necessary documents from AFM-EPF on June 5th, but were told by the fund's Executive Director, Maureen Kilkelly, that we will only receive the documents that trustees are legally required to produce, sometime around November 1st. 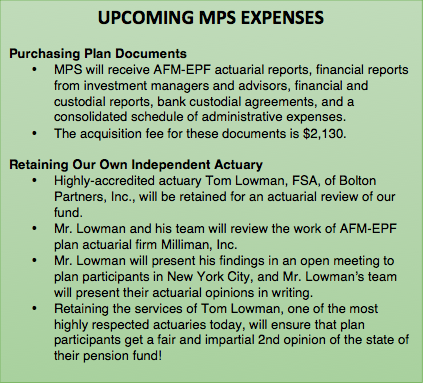 When they are delivered, we are proud to announce that Tom Lowman, FSA, of Bolton Partners, Inc., a highly-accredited actuary, has agreed to provide a detailed actuarial review of the AFM-EPF, utilizing those documents. This process will take funding. We must raise $15,000 by September to obtain our plan documents and retain our actuary!